(UPDATED January 10, 2015] MANILA, Philippines - ACET results or decisions for the freshman applicants who took September 2014 ACET (Ateneo de Manila University College Entrance Test) for AY 2015-2016 are already posted today, January 10, 2015 on a 5 set of boards at the ADMU Blue Eagle Gym and officially released online. 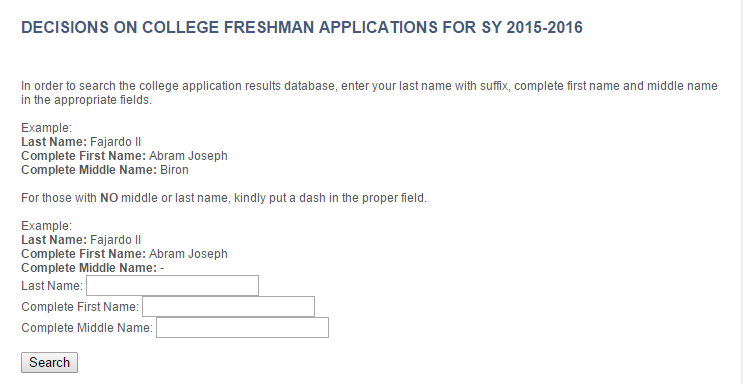 "The online search for decisions on college freshman applications for SY 2015-2016 will be available on Saturday, January 10, 2015 at 1:00 PM, " Ateneo announced on its website. Update: Results already posted at the Ateneo Blue Eagle Gym. The first ACET of 2014 was conducted last September 27 and 28 in Manila and provincial testing centers nationwide. Congratulations to all ACET Passers! Ateneo said that starting school year 2015-2016, it will begin its undergraduate and graduate classes in August instead of June. In addition, Ateneo already released the list of Freshman Merit Scholars, San Ignacio de Loyola Merit Scholars, and Director's List Scholars for SY 2015-2016. The Ateneo Freshman Merit Scholarship (AFMS) is an academic distinction awarded yearly to outstanding freshman applicants who have excelled in the Ateneo College Entrance Test, have distinguished themselves in their respective high schools, and who also show great promise for the future. This award includes a full tuition and fees grant for any undergraduate degree of the awardee's choice. The San Ignacio de Loyola Merit Scholarship for Public High School Students (SIDL) is awarded yearly to freshman applicants from public or state-supported high schools across the country. These students must have distinguished themselves in both academic and co-curricular involvement in their respective high schools and more importantly, show the potential to become future leaders and catalysts for national development. This award includes a full tuition and fees grant for any undergraduate degree of the awardee's choice. View the list of Ateneo Freshman Merit Scholars and San Ignacio de Loyola Merit Scholars here. Meanwhile, the top 200 list known as the Director's List Scholarship Recipients was also announced. The Director's List includes students who have done very well in the Ateneo College Entrance Test (ACET) and have distinguished themselves academically as well as in co-curricular activities in their respective high schools. The awardee shall enjoy an annual P50,000 scholarship grant for any undergraduate course of his or her choice. View the complete list of Director's List Scholars for SY 2015-2016 here. ADMU said that decision letters will be mailed directly to the applicant. Please get in touch with the office if no decision is received by March 2015. In the previous years, only around 20% of those who took the ACET passed the exam. The entrance exams last year drew around 18,000 examinees from the different high schools around the country. Ateneo Loyola Schools is a Filipino, Catholic, and Jesuit center of excellence of higher learning that is globally competitive while Asian in perspective, a community that transforms society through its research and creative work, its leadership in service to others and for the environment, and its formation of persons-for-other. Subscribe in our E- Mail list, Follow Us on Twitter or Like Us on our Facebook for more entrance exam results updates.